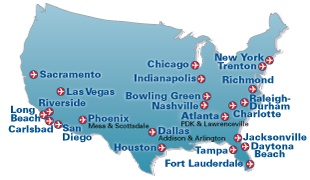 Today ATP announced that its two newest flight training centers are now open in Nashville at Smyrna Airport (KMQY) and in Phoenix at Scottsdale Airport (KSDL). Both locations offer ATP’s Airline Career Pilot Program. This advanced flight training program is the best in career pilot training. ATP students get the competitive edge with airline-oriented flight training at a fixed cost in the shortest time frame. They receive instruction from the most qualified instructors and proudly fly the world's largest multi-engine fleet coast-to-coast in a scheduled, monitored, airline-style environment using airline-standard Jeppesen IFR charts and approach plates. “Within just two months of opening Scottsdale, we’re proud to have already graduated a class of Private Pilots, and completed many add-on ratings and Airline Transport Pilot certificates,” said Jim Koziarski, ATP’s Vice President of Flight Operations. “As hiring gradually increases, more pilots are seeking their multi-engine ratings, CFI ratings and Airline Transport Pilot certificates to be competitive.” ATP now operates 25 total flight training facilities to meet this increasing need for airline-ready pilots.